"What do you want?" "I just want to know that it's, it's really happening." Sony has released a full-length trailer for the upcoming 40th anniversary theatrical re-release of Steven Spielberg's Close Encounters of the Third Kind. The classic sci-fi film first hit theaters in December of 1977, two years after Jaws. This re-release was first teased with a "mysterious" air traffic control video that didn't explain what exactly it was teasing, but that was quickly solved. Now we know the film is returning to theaters again September 1st and if you've never seen on it on the big screen before, now is your chance. Don't miss it! Starring Richard Dreyfuss, Teri Garr, Melinda Dillon, Bob Balaban, François Truffaut, Warren Kemmerling, and Cary Guffey. This trailer definitely makes this movie seem like a true classic - feast your eyes on this. You can also still watch that first ATC teaser for the Close Encounters of the Third Kind re-release here. After an encounter with UFOs, a line worker feels undeniably drawn to an isolated area in the wilderness where something spectacular is about to happen. 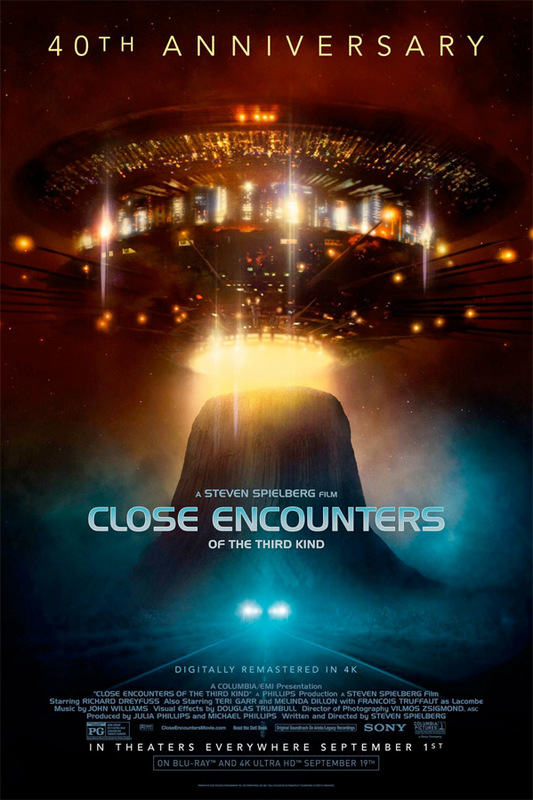 Close Encounters of the Third Kind was the sixth feature film directed (and written by) Steven Spielberg. It was first released in December of 1977. At the time, Columbia Pictures was having trouble and pushed Spielberg to finish it faster. They later let him go back and add more scenes to make a special edition "Director's Cut" of the film, which was then re-released in late 1980. There's no confirmation yet on which version of the film will be re-released this year. Visit the official website for updates. Close Encounters of the Third Kind will be re-released in theaters for the 40th anniversary for one week only starting September 1st, 2017 later this fall. Who is excited to revisit this?